Some great political theater came to Huntersville Thursday night. The show was put on by the new Lake Norman Conservatives activist group with all the ingredients for a solid performance - good speakers, good organization, and a good crowd. If they can repeat it on a regular basis, the group could be in for a long run on the political stage here in North Mecklenburg. to see GOP NCSEN candidates Thursday night. There was a definite Tea Party vibe to the event and the crowd. Guerrilla videographer Chuck Suter was on hand. Multiple small cameras were taking it all in. Christian Hine, President of CAUTION - Charlotte's main outlet for the Tea Party movement - served as the forum's moderator. The crowd was a bit younger, a bit more diverse, a bit more casually dressed than your average Republican Party affair. But make no mistake, they were equally as intense and interested as any you will meet in this area. When the questions started flying all three candidates presented themselves well. Dr Brannon has been on the stump for a while now. His delivery and detailed references to the Constitution are delivered with ease. Reverend Harris is as polished as you'd expect from a someone used to speaking with passion in front of a crowds. Heather Grant more than held her own. Seeing all of these candidates debate alongside of Thom Tillis would certainly have been interesting. But while Thom Tillis wasn't there in person and hardly mentioned at all during the evening, his supporters weren't going to cede any ground on social media during the event. A quick glance at Twitter showed the #NCSEN hashtag being bombarded with several Pro-Tillis tweets right at 7pm when the event was scheduled to kick-off. Coordinated by the campaign or just coincidence, they came mostly from a single account and appeared to be staged in advance and ready to fire from right at 7pm until roughly 7:30. An effort to dilute the "where's Thom" tweets expected to pop up at the same time? So, while Team Tillis seemingly wants to publicly ignore the other candidates in the primary race, it also appears they may not be taking any chances on letting the opponents have any free shots. With all sides gearing up for the final 90 day push to the May primary, ignoring the opposition will be harder and harder to do for Team Tillis. 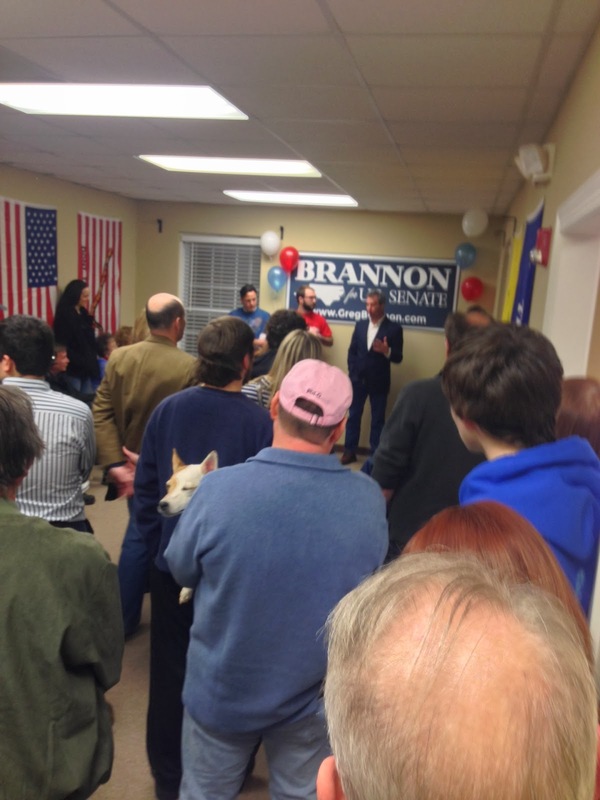 That's a task made even more difficult with the Brannon Campaign opening an office in Cornelius on Friday - right down the street from entrance to the Peninsula neighborhood - almost literally right in Speaker Tillis's back yard. Act One of this NCGOP primary drama is almost over with the main characters all set. The main question is will the story of this primary season end after Act Two in May or will there be a surprise Act Three and a run-off in July?